Sunita Staneslow teaches and performs around the world, and is a Certified Therapeutic Musician playing in hospital settings, for paediatric cancer patients, the terminally ill, and in psychiatric facilities. Sunita's solo recordings feature her improvisational style is inspired by her hospital work. 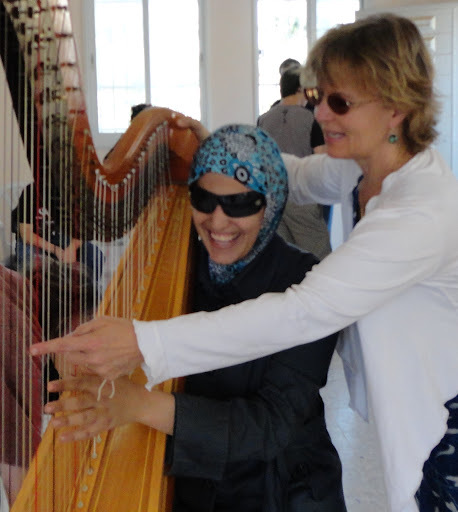 Several years ago Sunita met a blind Palestinian lady, Yasmine (left), at a musical workshop in a village near Nablus in the Northern West Bank. After Yasmine became enamoured with the harp, Sunita launched a fundraising drive and raised money to buy her a harp. Since then she has travelled frequently to the village to give Yasmine lessons, and also teaches her via Skype. Sunita has a Masters degree in Music and has played harp for over 40 years. She has two children and lives with her husband just a few minutes walk from the Mediterranean sea where she loves biking, running and walking her two dogs. In addition to CDs and books, Sunita's sheet music can also be downloaded from this link.